Will losses sink Illinois' Obamacare co-op? With a $50 million net loss heading into last fall's enrollment period for Obamacare, it wouldn't be surprising if Illinois' Land of Lincoln Health experienced the same fate as peers that have folded across the country in the past year. The Chicago-based health insurance co-op is one of 23 spawned by the Affordable Care Act to create competition on the health insurance exchanges and force down prices. But just three years in, 12 of the 23 have closed, says Sabrina Corlette, senior research fellow at the Center on Health Insurance Reforms at Georgetown University, beset by sick and expensive enrollees, legacy insurers with deeper pockets and federal funding that has disappeared. Iowa Insurance Commissioner Nick Gerhart oversaw the 2015 closure of CoOportunity, the co-op serving Iowa and Nebraska and one of the largest in the nation with more than 100,000 enrollees. If Land of Lincoln were to shutter, the Illinois Department of Insurance would either take over or monitor the company as it pays down claims. Enrollees would be offered a special enrollment period to find new health plans, and the larger insurers on the exchange, Blue Cross & Blue Shield of Illinois, UnitedHealthcare, Aetna and Humana, likely would scoop up most of their business. Formed as an alternative to big insurers and their pricey health plans, Land of Lincoln launched during the online marketplace's 2013 debut. It had a lackluster performance that first year with around 3,600 enrollees. The co-op made a comeback in Year Two, with about 35,000 enrolling after the exchange created plans centered on Chicago-area health systems, including Advocate Health Care and Presence Health, two of the biggest in the state. Enrollment has boomed in its third year so far to nearly 70,000 members. But so did operating losses. The co-op ended 2014 with a nearly $18 million net loss. As of Sept. 30, just nine months into 2015, that loss nearly tripled to $50.7 million on $109.8 million in revenue, according to the co-op's most recent financial statement. Land of Lincoln announced in October that it was capping enrollment in a bid to cut costs. Then recently, the co-op said it would drop University of Chicago Medicine from its network on March 1. The Hyde Park-based system is an academic medical center that treats the sickest patients, such as those who need expensive transplants or to manage costly chronic conditions. The Department of Insurance has at least two pathways should Land of Lincoln get into deeper financial trouble. If the co-op decides to stop selling policies altogether, it could pay outstanding claims under the department's supervision. The process could take more than a year, says Alissandra Calderon, a department spokeswoman. More aggressively, the department could petition the courts to become Land of Lincoln's receiver. In that case, the Illinois Life and Health Insurance Guaranty Association, a nonprofit that assesses fees to member insurance companies, would pay the co-op's outstanding claims to patients and their doctors if Land of Lincoln ran out of money. Similar funds covered more than $100 million in claims when CoOportunity closed. Anne Melissa Dowling, director of the Department of Insurance, says her staff is in daily contact with Land of Lincoln. She has asked it to set up a concierge line for people affected by U of C Medicine leaving the insurer's network. Carriers on the exchange this year formed smaller, more narrow network plans. Such plans are cheaper for consumers because they don't include many expensive specialty hospitals. The trade-off is that those enrollees have a smaller pool of doctors they can see at discounted rates. Enrollees flocked to Land of Lincoln partly because Blue Cross & Blue Shield of Illinois, the dominant insurer in the state, dropped its popular broad plan on the exchange this year. Co-op closures around the country have been rough. Colorado HealthOP fought its state-ordered closing in 2015, vowing that it would have been profitable in 2016. When New York regulators shut down Health Republic last year, the largest co-op by enrollment with more than 200,000 members, it told enrollees to find a new health plan or the state would assign them to one. The federal Centers for Medicare and Medicaid Services, which oversees the exchanges, eventually will want its money back. The federal agency doled out more than $2 billion in loans to launch the co-ops, including about $160 million to Land of Lincoln. CMS likely will have to get in line. 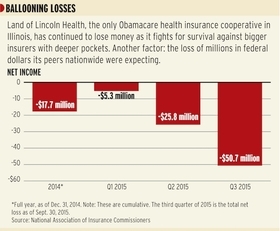 "Will losses sink Obamacare co-op?" originally appeared on the website of Crain's Chicago Business.